Ushering in a new generation of partially compostable cars, Ecovative has teamed up with Ford to use their mushroom-based foam as a key component in bumpers, side doors, and dashboards. The best part is that the material will decompose just one month after being buried. Gavin McIntyre and Eben Bayer discovered that mycelia (mushroom roots) are a natural binding agent that can be combined with agricultural products such as corn and oat husks to make an incredibly durable material that can replace styrofoam and polystyrene in practically every application. Several companies from a number of industries are looking to the Green Island, NY-based startup to cook up alternative materials for their products as well — so we can finally leave polystyrene and styrofoam in our earth-loving dust. Ecovative combines mushroom roots with corn or oat husks in trays of various sizes. These are then left to fester and furl in a dark warehouse for five days, after which the mix emerges glued together. This is then cooked and fried, and voila! a new packaging material is born. Not only is the new product biodegradable, but it is also fire and waterproof, making it an excellent substitute for polystyrene and styrofoam – the bane of every environmentalist’s existence. The head of Ford’s plastic research department Deborah Mielewski became interested in the product, as that company hopes to replace 30 pounds of each car’s petroleum-based foams with more environmentally sensible alternatives. 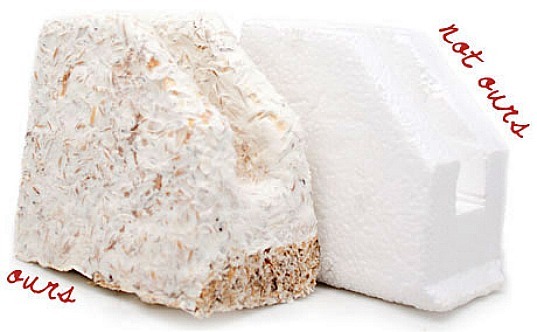 It turns out that Ecovative’s mushroom foam is every bit as affordable as polystyrene and styrofoam, uses very little energy, and reuses what would otherwise be agricultural waste. The company, which has approximately 30 employees, has received a total of $4 million in grants and other funding to buoy their research and development initiatives. Other potential applications for their products include cosmetics and computer parts; a wine distributor has even solicited their genius – but we’re not allowed to know why just yet. There is a caveat: Ecovative has to overcome the challenge of maintaining a consistent density with a raw material that is a living organism, but a lot of people believe that they are going to make it work. The obvious question is, of course, "Will you get high if your car goes up in flames?" Ushering in a new generation of partially compostable cars, Ecovative has teamed up with Ford to use their mushroom-based foam as a key component in bumpers, side doors, and dashboards. The best part is that the material will decompose just one month after being buried. Gavin McIntyre and Eben Bayer discovered that mycelia (mushroom roots) are a natural binding agent that can be combined with agricultural products such as corn and oat husks to make an incredibly durable material that can replace styrofoam and polystyrene in practically every application. Several companies from a number of industries are looking to the Green Island, NY-based startup to cook up alternative materials for their products as well -- so we can finally leave polystyrene and styrofoam in our earth-loving dust.